GALENA PARK – At the May meeting of the CIP, or Community-Industry Partnership, attendees learned of a huge new plant being constructed at the east edge of Galena Park, by Kinder Morgan, known as a Condensate Processing Facility. Plant Manager Derrick Bockius told the details of the plant, and showed slides of the site and the equipment. He said that the new “Splitter” would cost $370 million to build, and generate hundreds of temporary construction jobs and 23 full time positions. This is in addition to the 400+ employees that now work for Kinder-Morgan in the Galena Park area. Given industry standards, the community can expect another 150 jobs to be created in support of this plant by other businesses. Tax revenue paid by Kinder-Morgan for this plant will have an enormous impact on local government. Bockius said that they estimate property tax revenue to the City of Galena Park at $1.4 million annually, and $2 million to the school district. Another $900,000 would be paid to Harris County. Kinder-Morgan currently has several large terminal operations in Galena Park or the immediate area. A pipeline is being built that will bring more crude to the area for processing. Bockius said that there is an immediate need for new hires, citing 3 operators, 1 coverage operator for nights, and a supervisor. Jobs are posted online at www.kindermorgan.com, or www.indeed.com. Bockius also recommended interested applicants should consider taking a Petrolium Technician course of study at San Jacinto College. He said that he had received 2000 applications, alll had been considered and reviewed, and only a few were qualified for the type of work involved. The new plant site covers 67 acres, and will eventually hold 17 storage tanks. Production of the plant will be 1000 barrels a day at capacity. It is expected to be in operation by October 2014. The amount of revenue to be paid in property taxes will have a major impact on small government entities such as City of Galena Park and Galena Park ISD. Kinder-Morgan claims they are a good neighbor, with safety as a primary concern, according to Kent Miller, Director of Operations. He said that three water trucks and a street sweeper have been kept busy on Clinton Drive, since construction started, keeping the street as clean as possible. IMPORTANT NOTICE – The original route and schedule that was announced to the public has been changed. 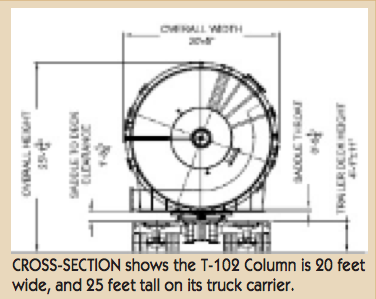 For logistic and scheduling reasons, Kinder-Morgan now plans on transporting the T-102 Column over Galena Park streets on Sunday, May 18, according to Derrick Bockius, KM superintendent. Originally, the route was to be totally overland on streets, a circuitous route that started at the fabrication plant on Clinton Drive, then Market Street, McCarty, and back to Clinton. Now the Column will be loaded onto a barge close to the old KBR property starting Tuesday, May 13, and moved by water to the Woodhouse dock in Galena Park. From the Woodhouse dock, the last leg will be back on a trailer as seen in this drawing, and hauled down Clinton Drive to the plant site, on Sunday morning May 18. This will be quite a sight for the public, with a minimum disruption of traffic.